"Graceful design and Superior quality" is the soul of Amazing Home. An elegant decanter, exquisitely hand-made, is not just a wine carafe but an artwork of craftsmanship. It has been designed to oxygenate the contents in wine and release more aromatic flavors, emerging the best wine experience as much as possible. Unique Scorpion shape and smoothly elegant curves, easy to hold and pour. Recommended optimum aerating volume is one standard-size bottle of wine. Please note that few small bubbles and other dimensional variations may be present because they are hand-made. We have prepared a small box of cleaning beads(50g) inside the package as a little gift. When you wash the decanter, slowly pour the cleaning beads into your decanter with some warm water, swirl gently until it gets clean. MAKES A USUAL WINE UNUSUAL. With this decanter, your guests will feel like you are serving them the best wine ever and bring your wine drinking experience to the next level. UNIQUE DESIGN. Unique Scorpion shape and smoothly elegant curves, easy to hold and pour. Made out of great craftsmanship with more than 10 years' experience. It adds an elegance and luxury to your home, bar or living room. Using it as a centerpiece on your table is quite the center of attention. LEAD FREE CRYSTAL. 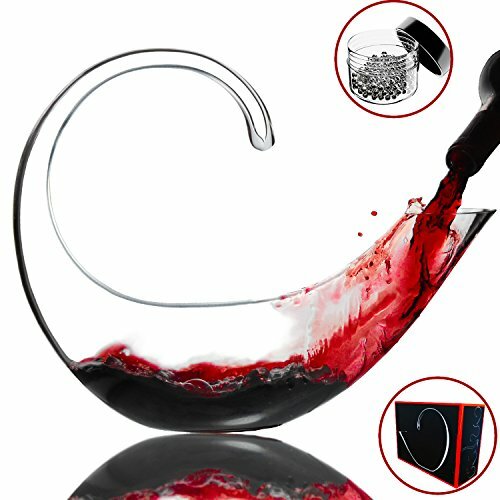 Made from high quality 100% lead-free crystal glass that makes you enjoy the wine without any concern. LARGE CAPACITY. Holds one standard-size bottle of wine easily. The wide contact surface provides enough breathing space for the best wine aeration and releases the rich aroma from the wine more efficiently. High:10'' Length:12.5'' Width:4''. PERFECT GIFT. Packaged in gift box with free cleaning beads. With proper care, it should last a lifetime which makes it a perfect present to impress your guests, wine lovers, and yourself. If you have any questions about this product by Amazing Home, contact us by completing and submitting the form below. If you are looking for a specif part number, please include it with your message.